In support of our amazing military and veterans we are joining other great bloggers to bring you this giveaway. Please take the time to read and learn more about the Benefits for American Heroes Foundation below. Then be sure to enter to win a $100 Walmart gift card! They currently have 165 + Veterans and their Families enjoying free Memberships to their Members Perks Program with more signing up every day. With your support, they will continue to make this valuable membership free to our Nations Heroes indefinitely. Benefits for American Heroes is working with Bonfirefunds.com to raise funds for their organization so they can help more Veterans. 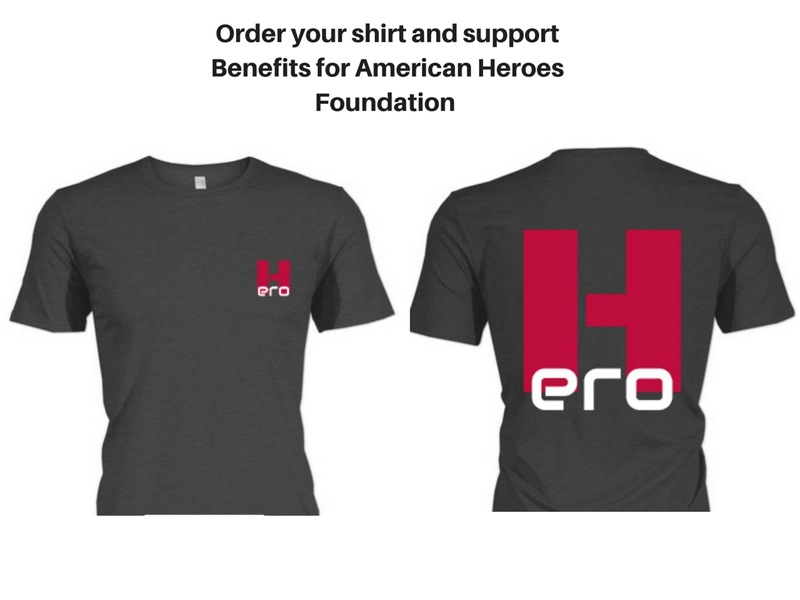 Check out this Hero t-shirts and order one now! Buy a T-Shirt and be a Hero for your Heroes! If you or someone in your family is a Veteran, you can also have access to these free perks. Sign up and start saving! The Benefits for American Heroes Foundation loves the benefits that are offered by VetsPrevail.org. It is an online program providing Anywhere-Based Care™ and support to Veterans and troops returning from deployment dealing with combat-related mental health issues such as PTSD, depression, and anxiety. Built for Vets, by Vets. Plus you can earn up to $75 in gift cards for completing the program. Benefits for American Heroes is sponsoring this exciting giveaway! 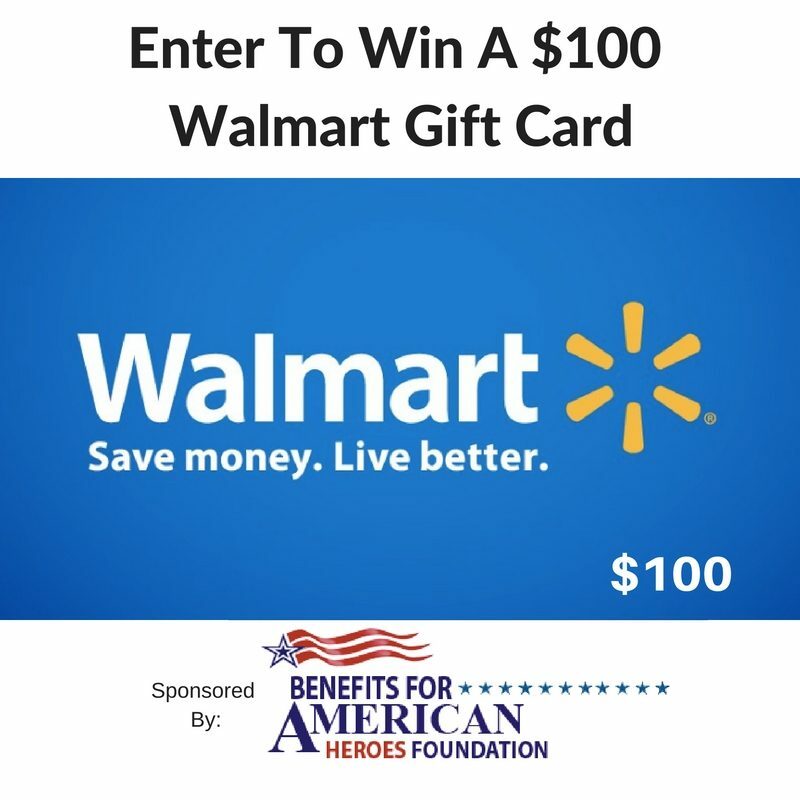 One lucky reader will win a $100 Walmart gift card. Just enter on the Giveaway Form below. This giveaway is open to US Residents. Giveaway ends on October 13, 2016 at 1159pm EST. *Please note – the shirts will only ship if a minimum of 18 shirts sell. You will receive your shirt 14 days after the campaign is over. Thanks for your support! My grandfathers and my dad all served in the military. My father and grandfather both served. My GF was in the Navy during WW2 and my father served in the Army for over 20+ years. My grandfather served as a pilot. He was an amazing man! My late father was in the Navy during WWII, and his brother served in the Air Force. Several of my friends served in Vietnam – fortunately, they all came back alive. And when I was in real estate, I had several clients who were veterans. Living near the Naval Air Station, there are a lot of veterans and active service members around here. My husband’s father was in the military. He served in WWII. Our hearts and prayers go out to those serving, have served, and their families. My father served in the air force and my brother served in the Navy. Both my husband and father served in the Army. My late dad was in the Navy during the Korean War. My husband was in Vietnam in the Army in the late ’60s. My brother in law is serving in the Army. My Brother In law! He’s a veteran now! My son is a veteran — joined the Marine’s right out of high school and did a tour in Iraq back in the early days. My Grandpa was in World War II. I am so lucky to come from a proud military family. The most notable is my great uncle who survived a Natzi concentration camp. My nephew served in the Navy. My brother served in the army. He lost his battle with ALS in 2011 but he was in good spirits and didn’t let it get him down. I live in a military town so I see lots of military everyday. On a personal note, my son-in-law serves in the Marines.